Browse Artists and Groups Percy Woodcock, R.C.A. Percy Woodcock was one of the accomplished Canadian artists that Sir William Van Horne, "the greatest of all Canada’s art collectors,"(1) engaged, offering complimentary transportation and some expenses, as he "…inaugurated an unusual promotional scheme when he decided that the Canadian Pacific should scatter paintings of the Rockies throughout eastern Canada... " (2) with a view in mind to them painting the magnificent and powerful views of the Rockies where the railway was forging beyond to connect the country from east to west without interruption. Percy Woodcock also served as an art advisor to Sir William Van Horne whose Montreal mansion was located, almost across Sherbrooke Street from our gallery, where the Sofitel Hotel is presently situated. In 1973 when Joan Murray was Curator of Canadian Art at the Art Gallery of Ontario, she included Woodcock in her exhibition Impressionism in Canada 1895-1935. 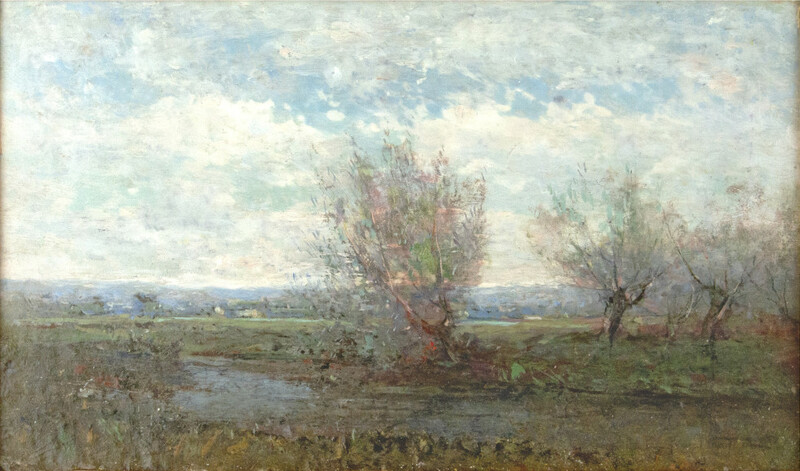 She wrote, "In contrast to other artists of his generation, such as Robert Harris and Brymner, who were not influenced by Impressionism until late in their Canadian careers, Woodcock adopted a gentle form of Impressionism soon after his return to Canada in 1894"(4). The painting to which Murray refers and which is illustrated on the following page in her catalogue is a fine canvas in the collection of the Montreal Museum of Fine Arts. Woodcock's terms of impressionism hold up especially well when compared to the summer Clarence Gagnon compositions , particularly the European scenes Gagnon painted as well as some of the equally precious Suzor-Cotés. Please send me more details about the following artist. Percy Woodcock, R.C.A.